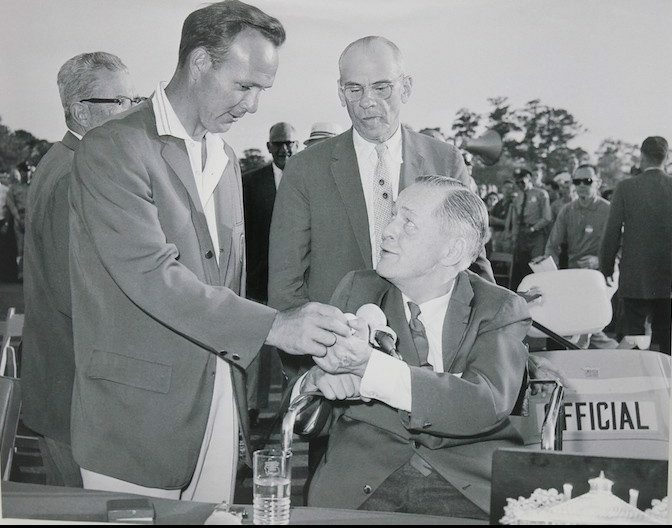 Timeless photograph of Arnold Palmer, Bob Jones, and Cliff Roberts in 1962 where Palmer captured his third of four Green Jackets. At the 1962 Masters, the other two in the 18-hole Monday playoff were also major championship winners: defending champion Gary Player and Dow Finsterwald, winner of the PGA Championship in 1958. Out in 37 and down three strokes to Player at the turn, Palmer shot a 31 on the back nine for 68, while Player shot a 71 and Finsterwald a 77. In the lead after three rounds, Palmer was five-over for his final round after a double bogey at the 10th hole. After five pars, he birdied 16 and 17 to get into the Monday playoff with a 75 (+3). The gallery for the playoff was estimated at 16,000 spectators.